Industrial PC with keypad and 15.0" XGA touchscreen display, Mobile Celeron 1020E, 4 GB DRAM, 240 GB SATA Solid State Drive, SATA DVD-R/W drive, One PCI & One PCIe Expansion Card and Windows 7 Professional (32-bit). 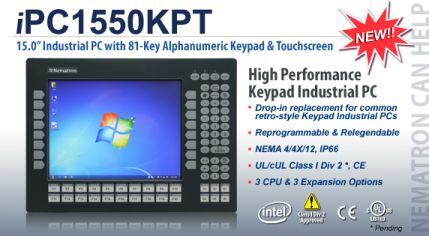 Industrial PC with keypad and 15.0" XGA touchscreen display, i5-3610ME 2.7GHz, 4 GB DRAM, 240 GB SATA Solid State Drive, SATA DVD-R/W drive, One PCI & One PCIe Expansion Card and Windows 7 Professional (32-bit). Industrial PC with keypad and 15.0" XGA touchscreen display, i7-3610QE 2.3GHz, 4 GB DRAM, 240 GB SATA Solid State Drive, SATA DVD-R/W drive, One PCI & One PCIe Expansion Card and Windows 7 Professional (32-bit).